I’m sure there are those of us out there who remember the Jim Henson Hour. A tragically short-lived 1989 anthology series (we are talking 3 and a half months short), the show normally ran as follows: a half an hour comedy-variety segment called MuppeTelevision, followed by a half hour special or a fairy tale retelling from The Storyteller series. Occasionally though, the entire hour would be devoted to one special. The Jim Henson Hour was great not only an opportunity to bring back The Muppets themselves, but the specials gave the company an opportunity to show even more creativity in not only storytelling, but puppetry, creature making, and special effects as well. Sadly, the show in its original format will most likely never make it to DVD due to licensing issues (Disney now owning The Muppets and Jim Henson Company owning The Storyteller and specials). But the good news is that you can easily get your hands on The Storyteller Series and most of the specials. Even better, Netflix instant watch has some of them too! One of my favorite specials is Monster Maker. Based on a book by Nicholas Fisk, Monster Maker tells the story of a young boy who dreams of creating monsters for the movies. There is only one small problem. His parents would rather he spend his time either loafing about with them or working at the family’s garage. One day, the boy’s hero, a famous special effects artist, stops by the garage and leaves his credit card behind. 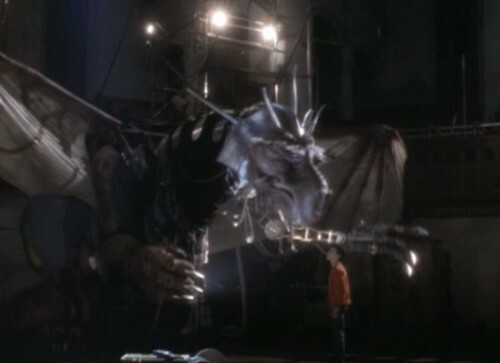 While returning the credit card, the boy lies about his age and lands himself a job at his hero’s creature shop, er um, I mean workshop. Then one night while working alone in the shop, the boy finds himself face to face (and talking to) the master’s latest monster masterpiece, the Ultragorgon. While the story itself is a bit thin and some of the pacing uneven, the Ultragorgon alone is worth a watch. Take a look at that first picture. 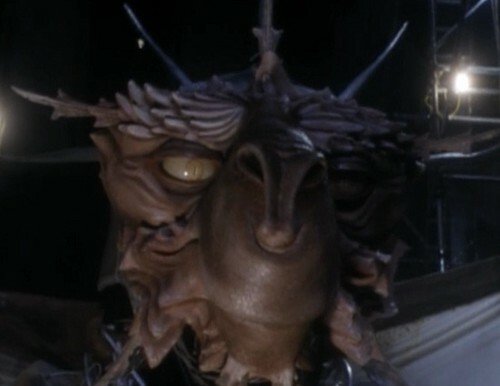 With his milky eyes and gauzy wings, my 9 year old self was fascinated by the Ultragorgon. Jim Henson’s creature shop succeeded in making something that is not only interesting to look at, but it still has a personality and fits the look of a creature that is still in the process of being created. Best of all, the Ultragorgon is, for all intents and purposes, a real thing. In other words, the Ultragorgon is not a digital image, nor are the actors speaking to a tennis ball on a poll in front of a green screen. He is there, tangible, and did I mentioned voiced by Michael Gambon?! For Henson fans like me, this is what its all about. And yes, if I had my way, I would keep him in my back yard and use him to scare off the neighborhood kids the next time they choose to set off fireworks at midnight. As I mentioned earlier, this one is available on Netflix instant watch. If you don’t have Netflix, you can find it on youtube, though I can’t make any promises about the quality. It might just be some transfer from a 20+ years old VHS, but if you’re lucky it might still have the awesome 1989 commercials in them. So there’s a bonus right there, right?